In a panel on Creativity and Pedagogy, Chris Wilson (Derby) packed lots of interesting data into his presentation about assessing and teaching creativity and was refreshingly definite on the subject. The idea you can only nurture creativity is wrong, he concluded. You can certainly smother it. You can teach it. Shaleph O Neil (Dundee) demonstrated rich outcomes through research-led teaching on creative interactions. Peter Woodbridge (Coventry) gave an inspiring report from a Department for Media and Communication who have embraced an “Open Media” ethos, thoroughly re-shaping their approach to media practice teaching in response to what it now means to be a digital creative practitioner. I chaired a panel on Collaboration, Participatory Practices and New Forms of Authorship which brought together two very different examples of media practice. First was Luis Andre Ferreira Alvez, from Portugal’s University of Aveiro, who is involved in producing Acqui/Here, a collaborative feature film project which is just kicking off with an international competition for synopses. Acqui/Here will tell ten stories of city life across five continents, with segments inspired by the Manifesto for the Public Space, an initiative that came out of Aveiro to foster creativity and community in the shared spaces of the city. The Acqui/Here project builds on a history of collaborative feature film production – works which have characteristically been given a dramatic unity through a focus on one city like 2006’s Paris Je T’aime . This portfolio approach to the feature film is now being given a new platform through the social web, which enables effective promotion to communities of interest and the recruitment of participants new to film production. Acqui/Here will pair experienced film producers and novice script writers who will win paid placements to develop the winning synopses. There were clear parallels between the practices Luis described and currents in contemporary collaborative documentary – the significance of social media, forms of shared authorship. In terms of editorial, Luis suggested that this approach could tap into the story potential in the diverse lived experiences of city dwellers, much as documentary can gain insights from the situated observations of distributed creators. It will be interesting to see the stories that come out of the current competition. While less obviously on overlapping territory with the CollabDocs project I found much of relevance in the second presentation by artist Susanne Stich of her recently completed PhD; ‘Agents and Insiders: Children’s Agency and Child-Adult Connectedness Explored Through Digital Video’. Susanne made an absorbing presentation of her thesis, in which she used digital video as simultaneously a mode of interaction and research tool in work with children. While taking from cultural geographer Owain Jones the idea “that some things cannot be fully known about children’s worlds” she worked with the recording technology as a bridge between the adult researcher and child subject, a bridge allowing a meeting place and stage for the co-created events that she captured on camera. This idea of an un-knowability within childhood is vivid in “Insider” and “Child-Agent”, the video works that Susanne produced within her research. 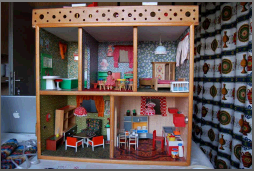 They’re lovely pieces, at once cool and tender, engaging with nostalgia – particularly evident in “Insider”, which features the doll’s house (the Marimmekko wallpaper! the tiny 70s furniture!) that was made for Stich as a child.